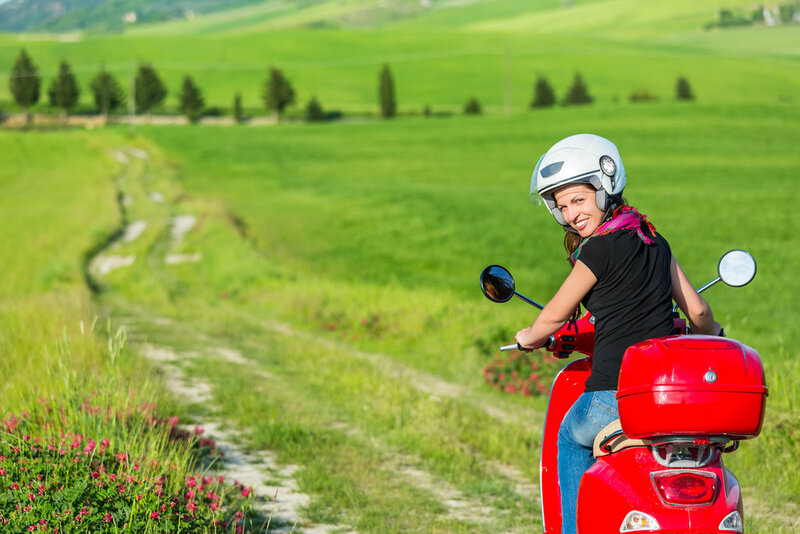 Great for foodies, wine enthusiasts—or anyone who appreciates making an especially cinematic trip through Tuscany’s lovely landscapes—this tour lets you enjoy the quintessential wine-country experience by Vespa. Your small group (with a maximum of 15 people) will visit two different wineries in the famous Chianti region, taste and learn about of the region’s top varietals, and savor an authentic Tuscan meal at an elegant boutique winery. Accompanying you will be an English-speaking guide whose knowledge enriches every aspect of your trip. After meeting your group (at 9:30 a.m. or 2:30 p.m.), you’ll board your private and comfortable coach for the half-hour ride to the Chianti region—where some of Italy’s most famous wine varietals are grown. You’ll be brought to an elegant Renaissance villa estate, where you’ll be outfitted with a Vespa and helmet, and set off on the (approximately 10-mile) riding part of your journey. More than 700 grape growers farm the approximately 100-square-mile region of Chianti—and your tour will bring you to visit two distinct examples of the area’s vineyard estates. Though the specific wineries will vary, you’ll be sure to explore at least one family operation that has employed the same growing, harvesting, and aging techniques for generations; you may also visit a winery that uses organic grape-growing and wine-making methods. At each estate, you’ll get a walking tour, meet the vintners, and enjoy a hosted tasting of their finest vintages. Your final tour experience will allow you to pair some of the unique Chianti wines you’ve learned about with authentic Tuscan specialties. Enjoying handmade pastas, fresh-baked breads, cured meats and olives—in the dining room of a centuries-old boutique winery estate—is a delicious way to end your tour. A valid driver's license is required to drive a Vespa on this tour. A motorcycle license is not required. Unfortunately, we are not able to accommodate children under the age of 13 on this tour. All children must be accompanied by a parent. Previous scooter experience is not required but advantageous and highly advised. The tour operator reserves the right of final judgment in client participation of scooter driving, and may discontinue scooter use at any point during the tour. Any participant unable to drive scooters safely may ride double with a partner, the guide, or a support vehicle. Third-party insurance for civil liability is included in the price of the tour. Please note that clients will be given the option to subscribe an additional insurance against vehicle damages. Sunscreen, comfortable clothing and shoes. You will be biking approximately 10 miles on the tour, on roads that are mostly unshaded.